Canadian Prime Minister Justin Trudeau’s Presence at “Khalsa” Event In Toronto Is Troubling. For the past four decades, terrorism has been an important factor in India’s foreign policy. Long before the 9/11 attacks spurred the United States into announcing a “global war on terror”, India was fighting its own battles: in Kashmir and Punjab, and with the Liberation Tigers of Tamil Eelam both internally, as well as internationally, where action on terrorism was a key component of bilateral relations. While there were countries where terror groups trained or were funded, such as Pakistan, or Bangladesh (pre-2008), there were still others such as the U.S., the United Kingdom, Germany and Canada where groups sympathetic to these extremists supported their activities. Through these decades, India’s bilateral relations with these countries have been closely aligned to their actions on terror. At the UN in 1996, much before the phrase “global war on terror” gained currency, it was India that first introduced the concept, proposing a Comprehensive Convention on International Terrorism that it still hopes will be adopted by all members. India’s message is simple: each country must adopt a zero tolerance policy to all violent ideologies that threaten ordinary citizens. India’s position has become more strident, with a push for the UN designation of terrorist groups as well as raising the issue of Pakistan-based terrorists at international fora including the G-20, BRICS and the South Asian Association for Regional Cooperation. Prime Minister Justin Trudeau was among the speakers at the 2017 Khalsa Day Parade. Given that position, it is surprising that the Ministry of External Affairs (MEA) chose to react meekly to the decision by Canadian Prime Minister Justin Trudeau to attend the “Khalsa Day” parade organised by the Ontario Sikhs and Gurdwara Council in Toronto on April 30. The images of pro-Khalistani militants are often brought out at these parades, as many of the marchers call for the establishment of a separate Khalistan, and this year was no exception. India had worked to ensure that Stephen Harper, Mr. Trudeau’s predecessor, didn’t attend the same event, and it wasn’t coincidental that Prime Minster Manmohan Singh (2010) and Prime Minister Narendra Modi (2015) visited him during his tenure as a result. That Mr. Trudeau chose to make his appearance in a year he plans to visit India is all the more startling. To be clear, the issue isn’t one of free speech or freedom of association. Neither is it to deny the brutal, shameful anti-Sikh violence of 1984. In India too, organisations are allowed to protest the events of 1984, as well as other wrongs perpetrated in India. But the occasion Mr. Trudeau chose to appear at had several other issues with it. First, it included several hard-to-miss posters and floats that glorified militants who included Jarnail Singh Bhindranwale, and Bhai Amrik Singh, who died in Operation Blue Star. Another photo was that of Talwinder Singh Parmar, a former leader of the Babbar Khalsa International that carried out the bombing of Air India’s ‘Kanishka’ flight in 1985 as well as a related bombing incident in which two Japanese baggage handlers were killed in Tokyo. Parmar died in a police encounter in Punjab in 1992. Second, the celebrations also honoured two legislators who had authored resolutions in the Ontario Assembly which declared events of 1984 as a “Genocide”. India had objected to the resolution when it was passed on April 6, both in official statements and in the meetings with visiting Canadian Defence Minister Harjit Sajjan, who himself comes with his own baggage, given his previous associations with these groups. In 2011, the Canadian government was forced to issue an apology to India after Mr. Sajjan, then the commander of the British Columbia reserves, sent military personnel to attend a ‘remembrance event’; photos of the same militants were displayed here. The third reason could have troubling repercussions. The Genocide resolution in the Assembly, which was hailed at the parade wasn’t restricted to the anti-Sikh riots, but to “events of 1984”, and activists say it criticises the Indian Army’s actions in Operation Blue Star as much as the riots. Finally, the Khalsa Day event also displayed flags and signs for “Referendum 2020”, a plan by local groups for a worldwide vote for all Sikhs, including those in Punjab, to vote for a separate homeland. 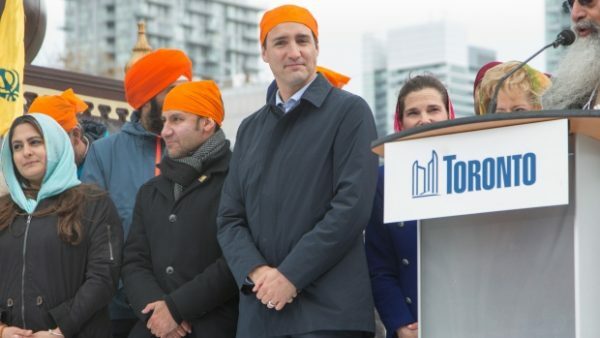 Mr. Trudeau attended the Khalsa day event just days after India’s last protest, and it is surprising that the government chose not to issue a statement. It took more than a week for the MEA to respond mildly, in an answer to a question: “We have taken up such issues in the past with the government of Canada, and in this particular instance too, that practice has not been discontinued.” India cannot afford to handle the issue with kid gloves. « President Sirisena and Premier Wickremesinghe Decide to Re-shuffle Cabinet to Avoid UNP -SLFP Crisis.